I'm Myles and welcome to Lil Legend Studio's Patreon page. As painters we can't help but chase after that lightning strike of inspiration we see in our mind's eye when we see THAT model. Something just clicks within us. We see a scheme and chase after it. And, like all painters, we get discouraged by the immensity of the work ahead. It's common, I still get this feeling. Worse still, you may feel like you can't tackle that model and let it linger in some dark forgotten place. You're too inexperienced, or the model is too complicated - it's too big to approach with a brush, too precious to even attempt. The aim of this Patreon is to share my experience with you and help you become the painter you always were. I don't want you to imitate my style, I want to develop yours. This Patreon is a resource for you to develop your own voice as a painter, to develop a style that is all your own. I want to encourage all painters, from pros to beginners, to develop their own techniques and ultimately forge their own identity with a brush. It's a golden age to be a content creator. Patreon allows me to produce tutorials, video seminars and host one to one teaching sessions arranged at your convenience, no matter where you are in the world. Enjoy a range of courses, from colour theory, advanced weathering to skin tones, all from the comfort of your own home. Writing tutorials is a time consuming process that I am now able to bring into my working day thanks to this platform. Regular, high quality articles supported by fortnightly seminars and one-to-one training will help build the skills you need to tackle the most challenging of models in your collection. Thank you all for your love and support. Now go paint your miniatures! All new feature! The directory - your handy, one-stop location to search for the exact tutorial you want. This is still currently under construction, but more will be gradually added over time. Painting is thirsty work, and this gives me that extra bump to pump content out. Be entered into a prize draw held from time-to- time to win a miniature painted by Myles. Access to PDF tutorials covering a whole host of subjects from brush techniques, to how to paint miniatures from start to finish. At least 1 document will be produced per month. Monthly patron-only seminars held on the second Sunday of every month. Each course is approximately 1 hour long. Each course aims to teach you a new technique in the fields of airbrushing, freehand, TMM, NMM etc. In depth video tutorials painting a miniature per month. Primarchs, tanks, advanced weathering, core skills and other courses that build into a comprehensive guide on how to paint your miniatures. Q & A live recorded sessions. 1 hour personalised Skype lesson per month (with the option to book more). Develop skills learnt through seminars with intense one on one tutorials to develop your skills. Follow up critique to help push the finish of your models. 2 Lessons per month membership. Supercharge your painting with two monthly lessons concentrating on your learning outcomes. Paint alongside me, learn new techniques, or save the lessons to tackle a larger project (such as a primarch, knight, superheavy etc). 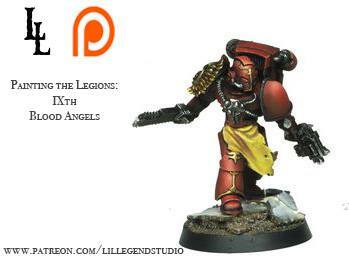 Weekly lessons approximately 1 hour long concentrating on improving all aspects of your miniature painting. Once a year I will randomly choose to host a weekend class in your area. Not content to only have online interaction? Why not write into me with a suitable class location and attendees and we'll bring the circus to you. Wherever you are in the world, it doesn't matter - I'm willing to travel and host a live weekend course for you.